Clinic Synopsis: Clarinet is the musical instrument which takes the majority among the wind band instrumentation. KCM has been commissioning numerous arrangers to transcribe various kinds of orchestra repertoires being rich & colorful textures such as Debussy, Ravel etc. At our session we would introduce the future possibility of Large Clarinet ensemble and various ways of exploitation on education site through our performance. 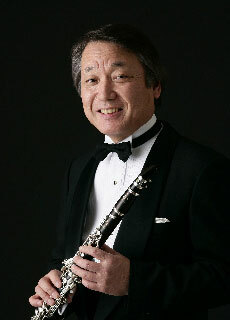 Clinician Biographical Information Tadayoshi Takeda is director of the Kunitachi Clarinet Orchestra. After graduation from the Kunitachi College of Music, he entered the Conservatoire National de Région de Rouen and studies under J. Lancelot. Next year, he graduated with the honor of the first prize. In 1977, the first prize at the Concours Général de Musique et d’Art Dramatique L. BELLAN in Paris, and also at the 47th Japan Music Competition in 1978. In 1979, the bronze medal at the 35th Concours de Genève. He has been recognized as the greatest solo clarinetist players in Japan, and has the wide range repertoires. Currently a professor of the KCM and fosters various talented clarinetists. In recent years, he conducted master classes at the Conservatoire national supérieur de musique de Paris, and also known as the one of a few educators who can pass the traditional French style music.